The library is home to a varied collection, which covers all undergraduate and graduate taught subject areas. Additionally our collections include: DVDs, fiction and titles by Fellows of St Hugh’s College. 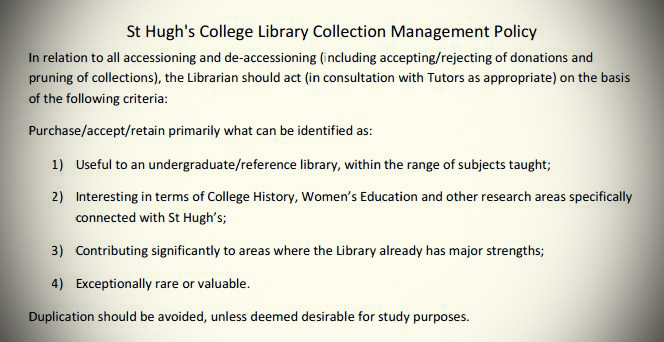 Our Collection Management Policy, below, includes more information on the type of materials we keep in the library. Books are arranged using the Dewey Decimal Classification System. If a book is marked ‘stack’ on the catalogue, please ask a member of the library staff to fetch it for you from the stack. The library has a self-service kiosk which allows you to borrow and return books any time of the day or night. You may borrow up to 20 books and the loan period is two weeks (vacations are not counted). You may renew each book up to four times online, if no one has placed a reservation/hold on the book. If you wish to keep any books for longer, bring them to the library office. Once you have finished using the books you have borrowed, please return them via the book return bin. Please respect these rules so that the Library remains a clean, comfortable and quiet place for all to study in. You may bring bottled water into the Library. No other drinks or food may be brought into the Library. This is to ensure our resources and study spaces remain clean, and that our Library is a comfortable place for everyone to work in. Please keep your mobile phone on silent mode in the Library, and step outside if you need to make or receive a call. If you would like to use headphones, please keep the volume low so that other readers are not disturbed. Laptops may be used throughout the Library, except in the silent study room on the upper floor. WiFi internet access is available in the Library. When you have finished working in the Library, take your personal belongings with you. Desk spaces may not be reserved and desks will be cleared every morning. Any personal belongings left unattended will be passed on to Lost Property at the College Lodge. Reproducing information from books, journals or the internet is subject to copyright law. Some published materials offer a limited licence to copy when use is for educational purposes. You can check the imprint page of the publication in question to check if this is offered. Please bear this in mind when photocopying, printing, photographing or scanning such information to ensure your use is legal. 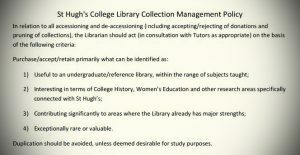 Access to St Hugh’s library is limited to current students and staff of the College. External readers may be admitted by appointment. If you wish to arrange a visit, please contact the library at least a week in advance.